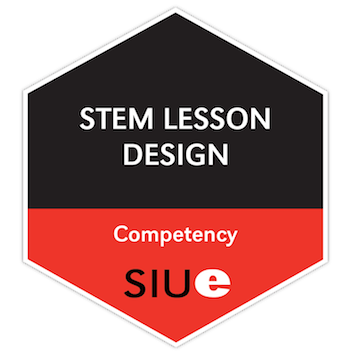 Digital badges are an excellent way to showcase your achievements to employers and supervisors, and the STEM Center is joining with SIUE to join this movement. As part of our professional development and volunteer efforts we are issuing digital badges to participants for their own records. These badges can be displayed on a digital dashboard which you can refer to on a resume or CV as an easy way to list everything you’ve achieved without cluttering up your document. They are also verified programs with metadata that can give an accurate and strong impression to potential employers or to administrators during employee assessments. Below is the list of badges issued by the STEM Center through our programs, for more information on each one just click on the image of the badge. If you think you have earned one of the badges but you haven’t received a link from us yet, visit this page and choose the “Claim Now” option. We’ll check our records and confirm your participation, then approve your claim to the badge. 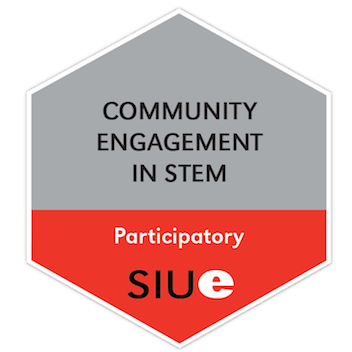 If you haven’t earned one of these badges but are interested, or you want more information on badging through the STEM Center or SIUE, please contact us at stemcenter@siue.edu. This is a foundational training for educators, both in and out of the classroom, on the techniques of discovery-based, learner-driven STEM inquiry lessons that include these process skills: observing, questioning, hypothesizing, predicting, planning & investigating, interpreting, and communicating. The SIUE STEM Center offers the training to anyone engaged in STEM education and earners are able to approach STEM lessons with a focus on inquiry regardless of topic. The 5E instructional model of lesson planning, first developed by the Biological Sciences Curriculum Study in Colorado Springs, is an excellent framework for constructing learner-driven lessons. Earners are introduced to this model and apply it by writing a 5E STEM lesson plan and are able to design lessons on a variety of science topics using these principles. The SIUE STEM Center relies on dedicated individuals to deliver quality programming in science, technology, engineering, and math to area schools and community organizations. Earners of the STEM Community Engagement: Bronze badge are able to take the lead on activities for the STEM Center’s outreach programming. They have shown their ability to handle a variety of topics and are volunteer leaders. The SIUE STEM Center relies on dedicated individuals to deliver quality programming in science, technology, engineering, and math to area schools and community organizations. After completing a considerable number of hours of outreach programming, earners of the STEM Community Engagement: Silver badge are considered to be exemplary members of the STEM Center outreach team who can mentor less experienced individuals. The SIUE STEM Center relies on dedicated individuals to deliver quality programming in science, technology, engineering, and math to area schools and community organizations. Earners of the STEM Community Engagement: Gold badge have completed a significant number of hours of community engagement programming and are among the most qualified members of the STEM Center outreach team. They are important leaders for other individuals and contribute to the improvement of STEM outreach programs. This candidate has completed the Noyce Summer Scholar Program at SIUE, a project funded by the National Science Foundation to encourage undergraduate STEM learners to share their knowledge with the public. Applicants are chosen for high potential in several important areas and each summer’s cohort delivers community engagement at a variety of sites around the country. Earners of the Noyce Summer Scholar badge are able to use their skills to deliver high-quality STEM lessons in informal settings.